If you don’t know your Spanish classical guitar composers, now is your chance. I was listening to them while I painted this, but it could also be that Fromage was listening to them when I took the photo of her while visiting her family on Easter four years ago. I got to see my former foster kitten again this Easter, and among other things it always reminds me of this inspiration. No, this is not one of my Five. Don’t I have enough black cats, I have to go looking for others? Well, Fromage is related to us, not by blood, but by bond. She is the neo-natal kitten I fostered in 2009, bottle feeding her and helping her along until I handed her over to the capable paws of the Fantastic Four so that she would learn to be a proper black cat. Fromage was rescued by and lives with a friend (Cranberry’s lady), and I visit regularly. 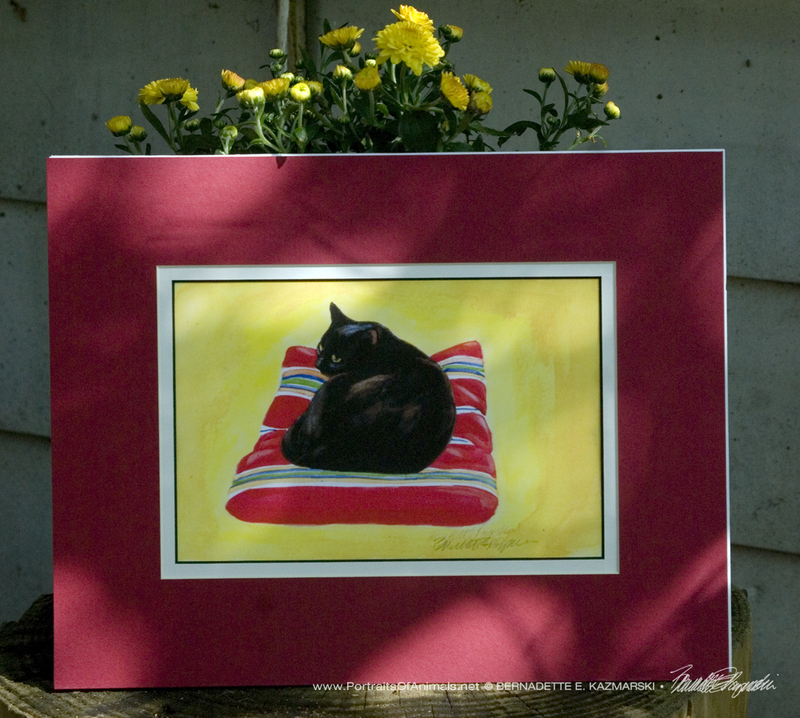 I took this photo of Fromage on the striped woven pillow last Easter, several photos in fact because her soft black shape looked so graceful on the colorful pillow, and ever since that moment this image has been requesting its chance to be painted. That happens with many images, like Dusk in the Woods and Peaches and Peonies—each time I thought about what I’d like to paint next, the painting itself would appear for me and patiently hover in my mind. When an image wants that badly to be painted you have to give in eventually. In fact, this painting was such a pest it was getting in the way of other things, like visualizing daily sketches and a portrait or two. And there are plenty other images I’ve been waiting to paint when I found the time, but this one finally won its place. And I’m really glad! So this is not really a “daily sketch”, it’s a planned painting taking a little more time and effort. Typically with daily sketches, no matter the medium, I don’t do a starting sketch underneath, I just start to paint, but here I did, wanting to be sure I captured all the details in proportion. And I wanted to work it a certain way, with flat bright colors but just enough detail through a few highlights and shadows. Fromage is not entirely black because I wanted to capture some of the warm and cool highlights and accentuate her graceful curve. The native pillow is really just a few colors but I wanted a little more shape in the larger red areas. And the pillow was on a tan leather couch but from the beginning I pictured this yellow gold background, kind of rough and slightly gradated, like stucco perhaps. That may have been a suggestion from the pillow, but I really was listening to Spanish classical guitar as I was painting and when I got to the background, last of all, after everything else had been painted, I was fully into the color and texture of antique stucco. This print was also part of my August 2016 Feline Sampler Box. You can order this box and all its contents on Portrait of Animals for only $35. 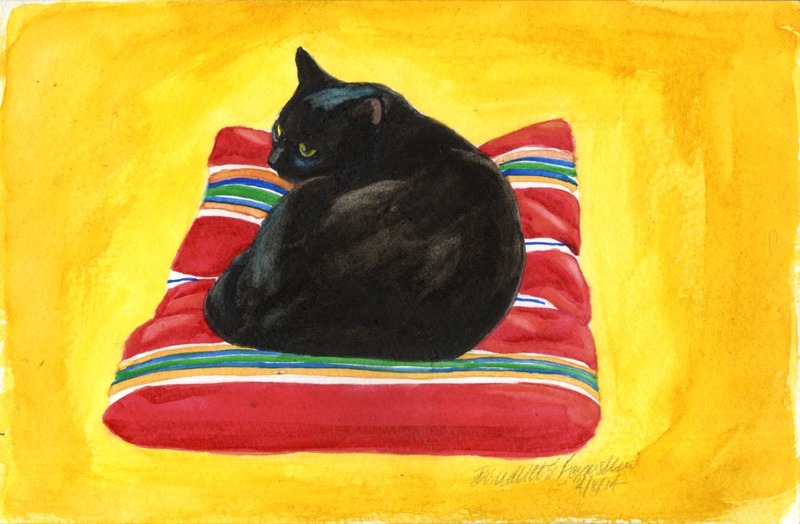 This entry was posted in black cats, cat artwork, feline artwork, watercolor and tagged black cat, black cats, cat art, cat artwork, cat sketches, cats, feline artwork, watercolor on April 2, 2018 by Bernadette.